This character was created by Richard for our Design A Character Competition, and illustrated by Sara Dunkerton. Senior Mechanician Smylzo Kaldu boards a train. His pocket watch chimes as the train moves off: on time. It is an anomalously large watch, kept in a specially made pocket of his waistcoat. 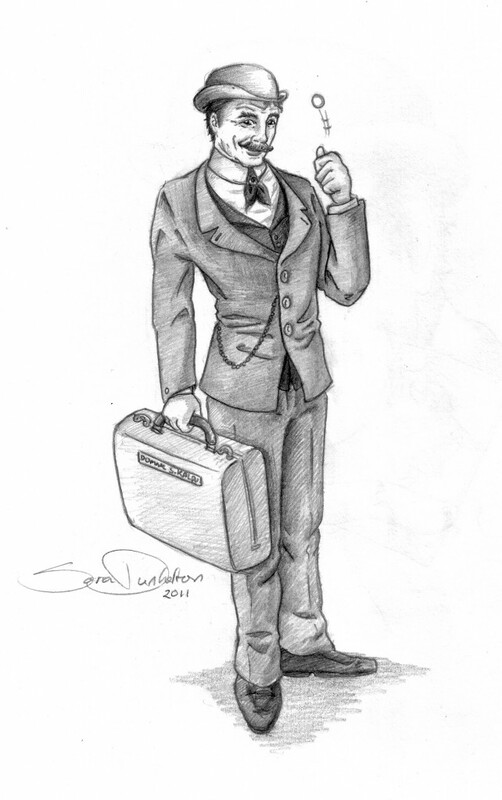 A well-dressed professional, wearing a reasonably new suit, a fashionable billycock hat and polished boots, it is clear that he is one of Promethea’s get-ahead, modern young men. His stiff, celluloid stiffened collar is cutting weals into his neck, so evidently he is prepared to put appearance above convenience. His curly hair has been brushed into submission with macassar oil, but his swarthy complexion, his villainous five o’clock shadow and his curl-tipped moustache proclaim to the world his lowly Roma origins. He has some quite heavy luggage – a custom case holding some piece of precision machinery. He lifts it on to the luggage rack smoothly, without noticeable effort. A mother and daughter are in the compartment, having difficulty with a hat box. ‘Doamna, your daughter’s shawl has caught on my coat buttons. Permit me..’ he disengages the shawl and arranges their boxes and baggage on the rack without any brash attempt to strike up a conversation. The girl in the compartment – the one he didn’t talk to – is looking at him. His face is long, humorous, with corded muscles making vertical stripes down to the edges of his mouth. His nose has been broken and reset more than once. When he speaks, there is a flash of gold. He has lost a couple of his upper teeth and had gold ones fitted. Domnul Kaldu is considerably above average height – approximately six foot and one inch tall. His build is wiry. His eyes are dark. He is less than 30 years old. She likes what she sees, but another passenger, a shaven headed gentleman with a Heidelberg duelling scar notices her glance and is angered. There is a pause as Kaldu looks him up and down. 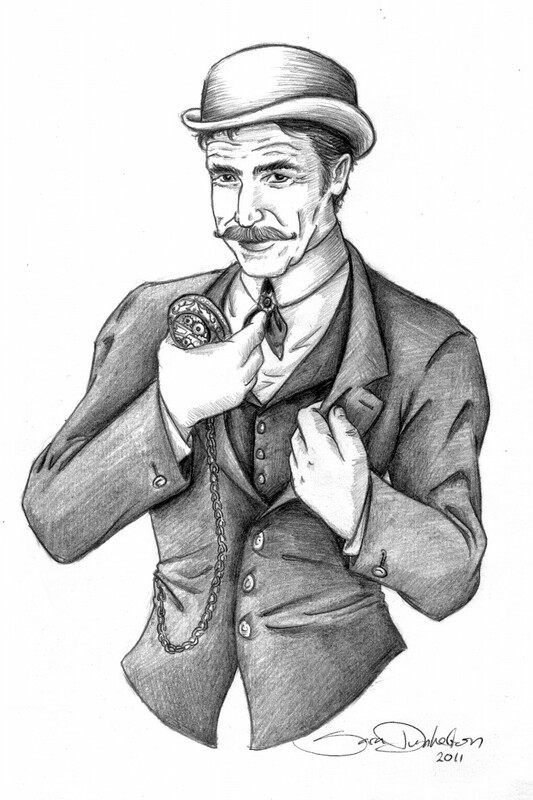 ‘You are mistaken.’ His hand goes into a waistcoat pocket and comes out with a coin. He twirls it between his fingers, evidently a nervous mannerism. ‘Your fingers are those of an artisan.’ Says the German gentleman. ‘Yet you are dressed – above your station.’ The coin is held now between two finger tips. The girl sees that Kaldu’s fingers are indeed scarred by manual work and engrained with oil. But his nails are nearly trimmed. ‘Few are foolish enough to trust a gypsy in a job requiring reliability or honesty. And therefore, I deduce that you must be an Eviscerator – a skilled worker in flesh. For that cannot be filched and traded for liquor. Or perhaps it can?’ The German would seem to be a privileged citizen for he has a sword with him. How will Kaldu deal with him? His eyes flick to the German’s luggage – also clearly labelled. ‘My apologies, Herr Colonel’ he says, ‘I am an engineer, planning and executing various projects in the precision clockworks for which Promethea is famed. But at least you are correct in your surmise that I am Roma. Allow me to demonstrate my stereotypical ethnic skills.’ Kaldu reaches into his jacket. The German’s hand goes towards his sword. ‘Oh no,’ says Kaldu, ‘I only wanted to show you our famed gypsy fortune telling.’ He draws a deck of tarot cards and fans it in front of the Colonel. 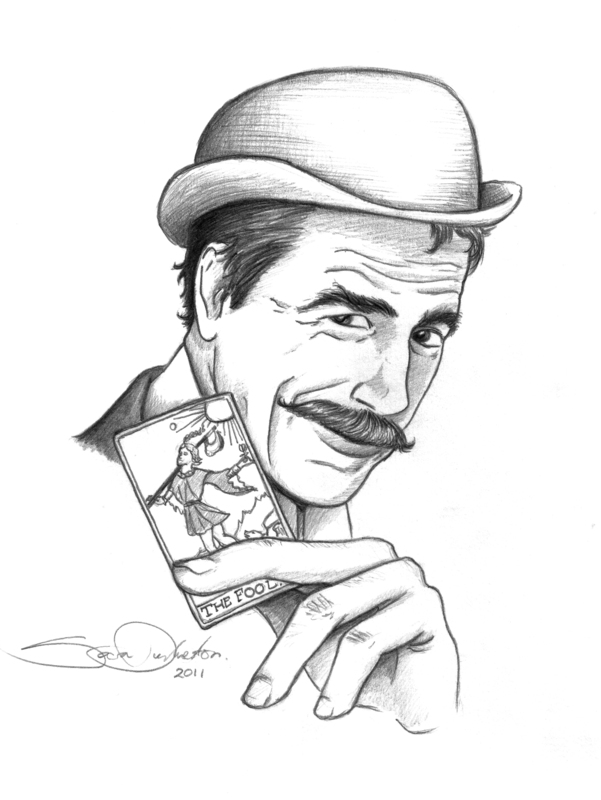 ‘Pick your card sir… or if you are unwilling, perhaps this young lady will pick your card for you.’ The Colonel huffs and turns red – the gypsy will not fight and he will not play. Her mother’s glare tells her not to, but she reaches out and taps a card anyway. ‘All gypsies are card sharps but I’m too sharp for you.’ Purple with rage, the German snatches a card rather than allowing the gypsy to handle it. That card too is – The Fool. The German goes for his sword but falls back into his seat as the train brakes. ‘My stop, I believe.’ Says Kaldu, taking back his card and opening the compartment door. Personality: Affable on the surface, with a deeper layer of reserve and downright secrecy. Social Ethics: A good citizen, a modern man – but also a gypsy. #1 Masterwork watch – he made this watch himself, at the end of his apprenticeship. It includes a chime and a timer. #2 Loaded cards – any fool can make loaded dice. These are a tarot deck – they’re not visibly marked in any way. It takes a clockwork master to conceal free moving weights, small magnets, and thin spring catches within the thickness of a playing card. Kaldu can read them by their unbalanced weight, palm them, pull them in and out of any shuffle. #3 A watchmaker’s lathe – an expensive machine tool, rather smaller than a sewing machine. #4 An Ibrik – a Turkish style coffee pot. Kaldu drinks a strong coffee to overcome the lack of sleep inherent in his busy lifestyle. #5 A silver coin – a Maria-Theresa Austrian Thaler, with the feet of the imperial eagle polished off the design. They’re not at the edge. That is not a natural pattern of wear: see complications. Personal Fortune / Income: 10 ban in pocket / income irregular – on completion of a project. Code of Honour (-5): Gypsy Solidarity – has to help a gypsy in trouble, however well deserved. Vow (-3): His entire family have been agents of the Hapsburgs since 1740: that ‘worn’ Imperial Thaler is their badge. His education was paid for in Imperial coin. He is their deep-cover agent within the Promethean elite: his controller is his grandfather. Watched (-2): There are cousins out there, reporting back to his grandfather, making sure he stays on mission. Ear of the Street (5) – his grandfather has an encyclopedic knowledge of thieves’ dens, fences and low bars: can always tell him where to start asking. Bolt hole (2) – a Vardo, a gypsy caravan. Needs to be mobile, since he’s a character that travels to the plot. Loyal Servant (5): The same cousins who pass him orders from his grandfather and watch to see that they are obeyed: they are also vowed to aid his missions. They count as one loyal servant, have only one area of special expertise between them: they’re sneak thieves. Not that they do robbery to order – which would be a plot-spoiling resource to give a character. Collectively: they can watch a person or place really well, 24 hours a day. The cousins are, firstly whippet thin Fonso (23) – badly flogged by thief takers as a child, he is an arrant coward; then Tsura (26) – whose hennaed hair hangs forward to hide her lopsided mouth – widened by a knife cut, possibly from a scar gang or maybe just in a knife fight; and finally Emilian (31) who was almost selected to get the engineers’ education that went to Kaldu instead. He doesn’t hide his resentment particularly well. Pugilist (3) – Gypsy bare-knuckle fighter, veteran of many grudge fights with Emilian. #1 Kaldu knows a lens-grinder named Yakul, worked with him during their engineering apprenticeship. This friend works for the Promethean government, and for Promethean scientists. He makes microscopes, endoscopes, artificial eyes and protective lenses. He can be found on the edge of cutting edge projects – of which he doesn’t always approve. He is a humane man, for a scientist and a hobby vivisectionist. Yakul buys ‘dancing mice’ and performs surgery on them to restore the defective inner ear that causes such creatures to stagger and ‘dance’. The survival rate is over 70% these days. With his medical talents so obvious, why doesn’t Yakul find more highly paid work, employing Frankenstein’s Gift in the service of medicine? Probably, he has pro-revolutionary sympathies and suspects that Kaldu does too. Their mutual relationship is based on the tacit acknowledgement that each has secrets and one does not pry into a friend’s secrets. #2 Kaldu’s other contact moves on the edges of high society – she is a courtesan, but also a skilled card player and even a challenging chess player. She claims to be exempt from the Harvest because she has a medical certificate attesting that she has haemophilia. Kaldu was present at the death bed of the old forger who wrote that certificate. The lady’s salon is frequented by scientists, diplomats and political figures. Kaldu and she share an interest in games and card tricks based on the longer, harder to manipulate tarot cards. If she has an agenda – beyond making money – then Kaldu has never guessed at it. And she is professionally incurious as to why he wants the pieces of information or the introductions that he asks her to arrange. Nevertheless, there is respect and friendship between them. Weapons: He knows gypsy bare-knuckle fighting and knife work: doesn’t carry a knife for he is a respectable professional.